Earl Dryer, Chief Boatswain's Mate, born Aug. 20, 1920, Homer, MI, and completed high school. 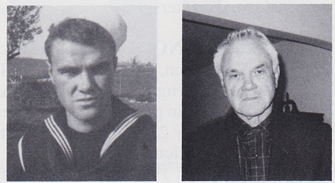 He served in the USN from Sept. 16, 1940-46 and in the USNR, 1946-51. He was stationed aboard the USS West Virginia and the USS PCS-1403. Memorable experiences include Pearl Harbor on December 7, invading Mariana, Saipan and Tinian Islands. Discharged Sept. 16, 1946, with the rank of CBM. He received the Pearl Harbor Medal and all the usual medals. Has been married to Lois for over 47 years and has two children and three grandchildren. He was superintendent on five disposal plants and the owner of his own excavation company.